Thread: Is there a basic test kit with distinctive yellow colors? My ph and chlorine test kit was purchased at Menards. I see the red shades of color for ph just fine, but I struggle to match the very subtle yellow color shades for chlorine. Do you know of a kit where the yellow comparison colors are more distinct rather than being about the same? Re: Is there a basic test kit with distinctive yellow colors? 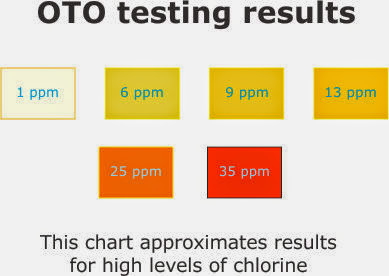 OTO is the only yellow chlorine indicator in common use -- that's what you've got, and there is no 'more distinct version'. Your other option is the K2006 (@ Amazon) kit we recommend. It is a back-titration from pink to clear. I haven't heard of anyone having trouble seeing it, since it's a presence/absence determination. It's also FAR more accurate, when testing chlorine and CYA, then test strips. And . . . before you waste your money, there is NO electronic chlorine meter that (a) works and (b) costs less than $1,000. And before you consider it (I don't know your budget), you do NOT want the $1,000 version: it takes special handling and regular re-calibration! Oh, and one more thing. Do NOT confuse the K2006 with the K2005 . . . which might be available locally. The chlorine test in the K2005 is not a titration, but a color-match to PINK shades that many find hard to discriminate. +1 on the chlorine test that comes with the Taylor k2006! I switched from the color matching test (ugh!) to this test many years ago and never looked back. It so much easier to use and far more accurate. I have found a method that helps distinguish the colors for C or Ph. Take piece of card stock about 3" x4". Cut a slot in one end that is the width of the color bands and long enough to expose the test solution and the color bands. Then hold the card against the test container and move the slot up and down to only view one color at at time to get a match. The eye is very good at side by side comparisons, but when you see all at one time the brain wants to average them out.